Glencore is one of the largest mining companies listed on the London Stock Exchange but its headquarters are in Switzerland and it holds its Annual General Meetings there. 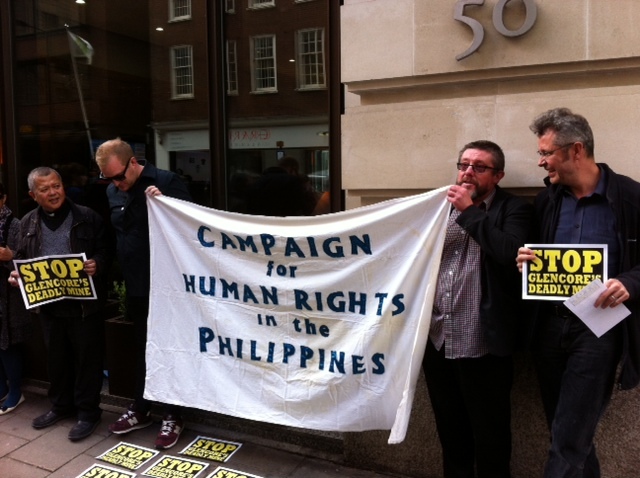 London Mining Network member groups and friends worked together with colleagues in Switzerland (including global mine workers’ union IndustriALL) to target the company’s May 7 Swiss AGM with a demonstration in London and a presence at the AGM itself. The Mines and Communities website carries a full roundup of news about Glencore’s AGM and related financial press coverage. Swiss group Multiwatch has published a report, Billions from the Exploitation of Raw Materials – the Swiss multinational corporation, Glencore Xstrata, and there is further reporting in financial publication Market Watch about Glencore’s relationship with the Colombian military.